The best feeling when I'm sewing is loving the process. Enjoying each stitch, seeing my work come together and loving the result. Sewing satisfies me for different reasons and I enjoy machine projects but hand sewing is another level for me. It has a comfort and calm to it, my hands working away while my mind relaxes. It feels so good to get back to working on my green tea and sweet beans quilt. The print is Hiding Cats, Cocoland by Kokka and all the Cocoland cats are so sweet. These are such sweet blocks! I feel the same about working on the gtsb quilt. I love your blocks! So nice to discover your blog! I totally get the draw of hand appliqué. it's on the list! Sweet indeed, love that kite flower!! 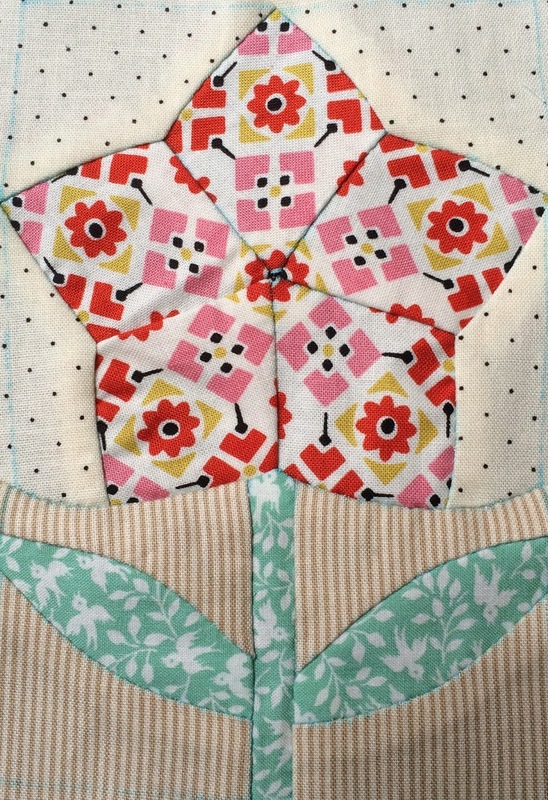 I can totally relate to your comments about hand sewing- piecing, appliqué or quilting are all so relaxing and satisfying! I am so looking forward to seeing all those blocks together! gorgeous! you really make me wish i was doing this quilt! Yes I feel the same way. I don't enjoy machining much, but I love to hand sew. I'm nearly 60 and getting some aches and apins in my hands but taking glucosamin and chondroitin, so hopefully be able to hand sew for a lot longer. Otherwise me and the sewing machine are going to have to make friends!